If you’re lucky enough to fly over Kodiak on a clear day you’ll likely catch a glimpse of the dramatic contours of mountain peaks and deep bays that give the island its iconic Alaska landscape. Upon landing however, you’ll soon realize that the offshore activities give the community its identity, history and economy. 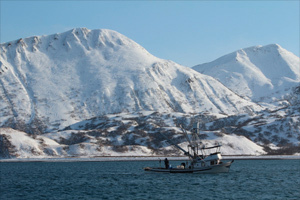 Driven by the abundance of marine life surrounding Kodiak, commercial fishing is the mainstay of the island community and economy with one in every three jobs connected to the industry. Located 250 miles southwest of Anchorage, Kodiak Island is home to large and small vessels representing nearly every gear type (e.g., trawl, pots, nets, longline, jig, dive). Major fisheries include crab, herring, halibut, groundfish and salmon. As the largest and most diversified port in Alaska, Kodiak consistently ranks among the top ten fishing ports in the United States for commercial fishery landings and values.